Fresh tributes have been paid to the iconic Limerick singer as the first anniversary of her death approaches. This week will mark one year since the sudden passing of Dolores O'Riordan, who died in London at the age of 46 last January. In the wake of her death, the remaining members of The Cranberries confirmed that the group were working on a new album. 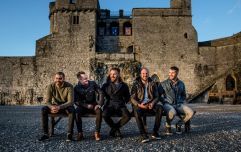 Later in 2018, the band announced their intentions to finish the record and to officially split thereafter. Noel Hogan, Mike Hogan and Fergal Lawler have posted a new note on the Cranberries website, confirming the release of final album In The End while reflecting on their career and the legacy of their fallen leader. "After Dolores' devastating and unexpected passing in January 2018, we took some time out and put all plans on hold," said the trio in a joint statement. The note goes on to mention that the band spoke with O'Riordan's family who agreed that they should press on with In The End. "It was a very emotional process for us," the Cranberries continued. The final album, expected to arrive this year, is dedicated to O'Riordan's memory. "She will be always with us in her music," the band signed off. On Sunday, hundreds of fans gathered in Ballybricken in honour of the first anniversary mass of the late singer, with both her mother and granddaughter singing hymns in the church.